ND Brown is a hot box specialist with depots across the UK. We have hire vehicles with a range of capacities and we also have a collection of used hot boxes for sale. If you are looking to buy a used hotbox for your project look at the Vehicle Sales section of our website. 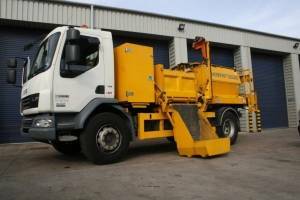 At the time of posting this blog we have 5 hot box and road mender vehicles of various types up for sale. These include a 2008 Iveco Eurocargo Roadmender with twin hotboxes, a 2008 DAF LF45:140 with Phoenix Twin Chamber body, and two 2011 Mitsubishi Fuso Canter with a single chamber and 3 tonne payload. We also have a rear steering 21 tonne DAF Roadmender with 5 Cubic metre Econ twin chamber Hot Box. Short or long term options are available for hot box hire. All have electronic thermostatically controlled gas systems to give you complete control when keeping the asphalt and bitumen at the right temperature. They have the necessary beacon bar, chapter 8 chevrons and universal adjustable towing equipment. There are variations on this specialist vehicle to suit the requirements of your project. From 7.5 tonne up to 26 tonne, twin chambers, and side tipping trucks are available. Within our vehicle hire packages we can also arrange for the hot box to be delivered and collected to your location. So that you don’t have to waste time and money on organising this for yourself, you can just get straight down to work. Whether you are looking to hire or buy, let us help you find the right option of hot box vehicle to help you make your surfacing project a success. Contact us today for further information about our sale or hire vehicles. Or if you would like a quote for hiring, we’ll be happy to advise you.